4:17 A.M.: Dear friends and acquaintances: stop posting this chart already. Dear friends and acquaintances: stop posting this chart already. Perhaps you've seen this chart. I myself have seen it many times, over and over, on my facebook feed. Over and over and over. It's not hard to see why it's getting reposted so much: it's intuitive, it's simple, it boils down all the tension in America over the last two years into a single straightforward problem. It is also wrong about everything. It fails on every front. The chart fails as a description of the situation. There might be some overlap between the Tea Party and the Occupy Wall Street movement, but by and large most Tea Partiers are, in fact, right wing activists. They subscribe to traditional Republican dogma. This has been demonstrated again and again, in poll after poll. This means they are more predisposed than average to be sympathetic to private interests. Likewise, the roots of the Occupy Wall Street movement are in the left. Sure, they oppose banks and corporate interests, but they also are basically in favor of government. They like redistributionism. They like the social safety net. They're not marching in the streets in order to end big government and institute some dumb laissez-faire fantasyland, they're marching because they want to tax the millionaires and use those taxes to pay for college funding. Put bluntly: there is virtually no overlap between these two groups. Occupy Wall Street is defined in part by its opposition to the things the Tea Party believes, and the Tea Party is defined in part by its opposition to the things Occupy Wall Street believes. The chart fails as a normative policy prescription. In suggesting that everyone in America is worried about the same thing, it implicitly endorses that supposedly universal concern. Unfortunately, it's almost impossible to connect the worldview it describes with the actual world we live in. The chart describes a collusive system in which Big Government and The Corporations boost each other up on the backs of the common man. It starts, it seems, with "large corporations lobbying for the government to have more power." Ah, yes, indeed. Who can forget the time Exxon-Mobil lobbied for the EPA to adopt broader authority over emissions? Oh, that didn't happen? How about when Citibank lobbied to centralize banking oversight in one strong regulator? Wait, they did no such thing? Well surely you remember the time health insurers lobbied for large national insurance exchanges instead of localized state exchanges? It's a ridiculous to think that corporations would, as a rule, favor larger government. It takes about two seconds to see why: corporations generally prefer less government interference in their business, and they lobby for smaller, weaker government because a smaller, weaker government is less able to interfere. Government can overwhelm private enterprise in the right circumstances. And wealthy, emboldened private enterprise can certainly capture government agencies. But genuinely powerful government does not go hand-in-hand with large, out of control corporations. There's only so much civic space to fill, and they can't both fill it. History backs this up. It's hard to think of even one major example of this dynamic playing out in modern-day America. The idea that it is not only happening, but somehow endemic, is completely absurd. Oh, and finally, and maybe most gratingly of all, the chart fails as a functioning Venn diagram. Because as you no doubt learned in early grade school, the basic rule of Venn diagrams is that the overlapping section should include something that falls into both sets. Instead, this chart includes something that incorporates elements of both sets but really falls into neither. To fix it, it would need three circles, none of them overlapping, and one of them very tiny. 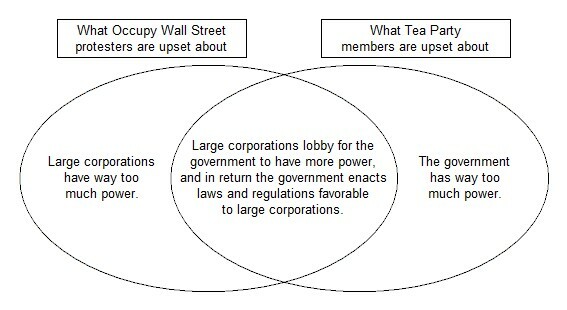 The labels should read "What Occupy Wall Street is upset about," "What the Tea Party is upset about," and "What dead-ender libertarians are upset about." But since that chart doesn't exist, please, let's not let the dead-ender libertarians pass their beliefs off as everyone else's. The chart is like that scene in Kiss Kiss Bang Bang, when he realizes that the two cases he's working on are actually the same case!